In 1872, New Orleans is a city ruled by the dead. But to seventeen-year-old Celine Rousseau, New Orleans provides her a refuge after she’s forced to flee her life as a dressmaker in Paris. Taken in by the sisters of the Ursuline convent along with six other girls, Celine quickly becomes enamored with the vibrant city from the music to the food to the soirées and–especially–to the danger. She soon becomes embroiled in the city’s glitzy underworld, known as Le Cour des Lions, after catching the eye of the group’s leader, the enigmatic Sèbastien Saint Germain. When the body of one of the girls from the convent is found in the lair of Le Cour des Lions, Celine battles her attraction to him and suspicions about Sèbastien’s guilt along with the shame of her own horrible secret. 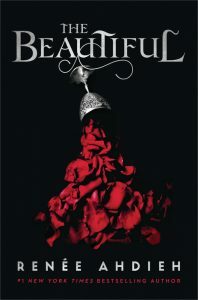 surface.At once a sultry romance and a thrilling murder mystery, master storyteller Renée Ahdieh embarks on her most potent fantasy series yet: The Beautiful. one word – VAMPIRES. I’ve been craving a really decent YA vampire book since THE COLDEST GIRL IN COLDTOWN by Holly Black. This sounds like it’s going to tick all my boxes for a book and I’m so excited to get my hands on it! Just by watching this book trailer, I know it’s something I need in my life. Waiting on Wednesday was originally created by Jill at BREAKING THE SPINE.